I remember loving Accurate Fishing Products when they just made quality fishing gaffs. We all love those cool multicolored side plates they made for Penn reels. Since then, they have grown to be one of the world’s major fishing tackle manufacturers and are now a major sponsor of the Fred Hall Shows … The Ultimate Outdoor Experience. Accurate Fishing Products was spawned out of a family business started by Mike Demarco some 50 years ago, known for its precise machining processes for the aircraft industry. Years later, his son-in-law Jack Nilsen took over at the helm, and continued making high-end parts for the most well-known aircraft companies in the U.S. Accurate, being a family run business, was looking at the third generation of the family to get involved — and along came the twins, Douglas and David Nilsen. Jack loved to fish and would spend his free time chasing game fish down Mexico way. 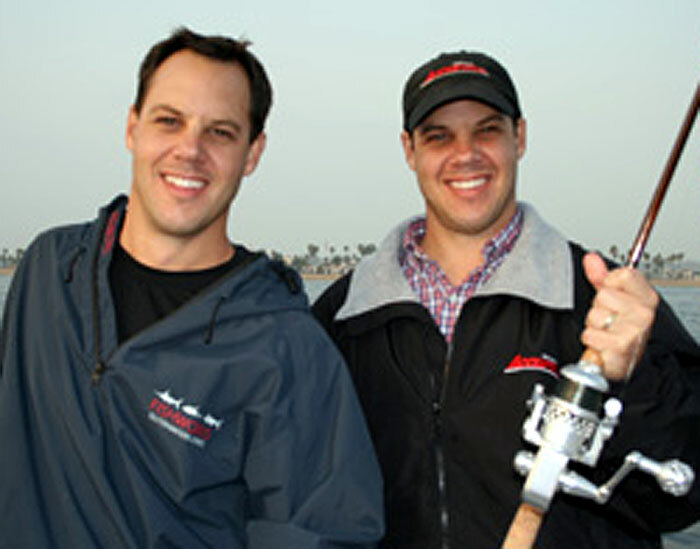 The twins, seeing their father’s passion toward fishing, got an idea that they would commit their time to make Jack a fishing reel for his adventures. They tried several designs, but were mesmerized by the caliber twin disc breaks on a car. With further thought , including three years of trials, Douglas and David came up with what is now Accurate’s patented TwinDrag system, known worldwide. The system enabled Accurate to create more drag surface, a smoother drag and an even amount of pressure on both sides of the spool — helping anglers worldwide land game fish on smaller reels, with confidence. Accurate Fishing reels were born — and in a matter of just 12 years. Today, the ATD Platinum line, Boss Extreme, the new Fury and Dawg Pound series, as well as the SR TwinSpin spinning reel series, are being sold globally. The Accurate team prides itself on raising the bar in reel manufacturing and striving to make the best possible products for the world’s anglers. All products are made here in the U.S., of the finest materials. Fishing is more than a business to the Accurate crew — it’s a lifestyle that all of them have been living throughout their lives on the oceans of the world. They are here to create dreams through their products, as well as help pass on the information they have learned to those coming into the sport. Accurate is committed to making the best possible products for your fishing needs.